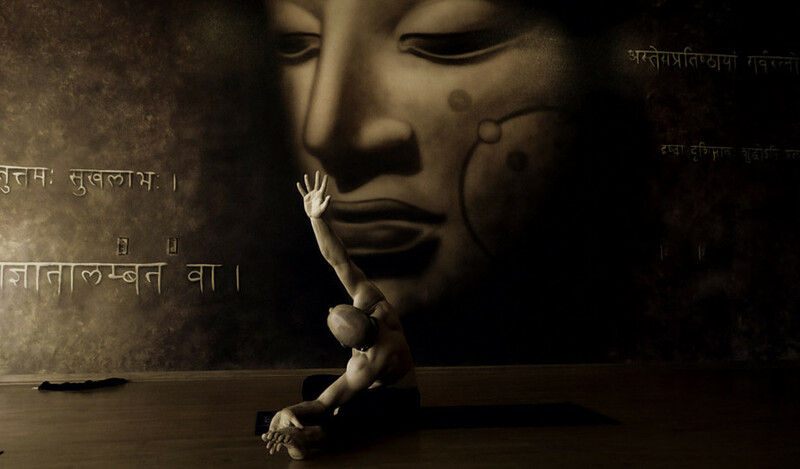 A great source for Yoga Postures by Mark Giubarelli. From a seated position extend one leg diagonally out. Raise the navel and chest up then lean forward trying to keep a good length in the front of the body. Twist the upper body towards the extended leg and lean forward and down as far as possible. Place the hands on the leg or if the legs and lower back are flexible grab the foot. Point the toes, heel or ball points of the toes in the leg that is extended out. The elbows are shown both up and down on the mat. When the traditional version of this pose is performed the foot of the bent leg is placed at the top of the inner thigh on the extended leg. This causes the lower back to be stretched more on the side of the bent leg and leaves the side of the body crushed a little on the side of the extended leg. If the foot of the bent leg is placed around the knee of the extended leg the hips align better. This allows the lower back to be more evenly stretched on both sides. The neck holds a lot of tension. Try to ease this so that the element of water flows better. The foot on the bent leg can be sideways into the straightened leg or the sole of the foot can be turned upwards and placed under the extended leg. 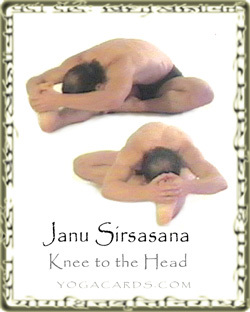 The knee moves down towards the mat if the sole of the foot is turned up. The hamstring muscles are stretched (the biceps femoris, semitendinosus and the semimembranosus). Lower back muscles are also stretched along with deep muscles and ligaments that run along the spine. The Trapezius muscles are well stretched during this exercise. Try teaching this pose with the toes pointed. The hamstrings and calf muscles are stretched many times in a sequence but the ankles and anterior lower leg muscles are rarely stretched.